In May of 2018, New York City Mayor Bill de Blasio announced a new plan to increase diversity in the city’s eight specialized high schools, which are some of the city’s most exclusive, successful, and least representative schools. This plan has been highly controversial within some parent communities, the city’s government, and in the New York State Legislature, the body that would need to approve it. We’re not here to debate the merits of the plan, however, but rather to analyze media coverage of the issue. Chalkbeat and The New York Times stood out as outlets that have reported heavily on de Blasio’s new proposal, so that’s where we decided to focus our analysis. We examined their coverage of this controversy from the period of June 2, 2018 to January 20, 2019 in order to assess how well the outlets informed the public and included the voices of students — especially black and Hispanic students — whose lives will be affected by the proposed changes. We found that the coverage has not sufficiently represented perspectives of current students or black and Hispanic parents. 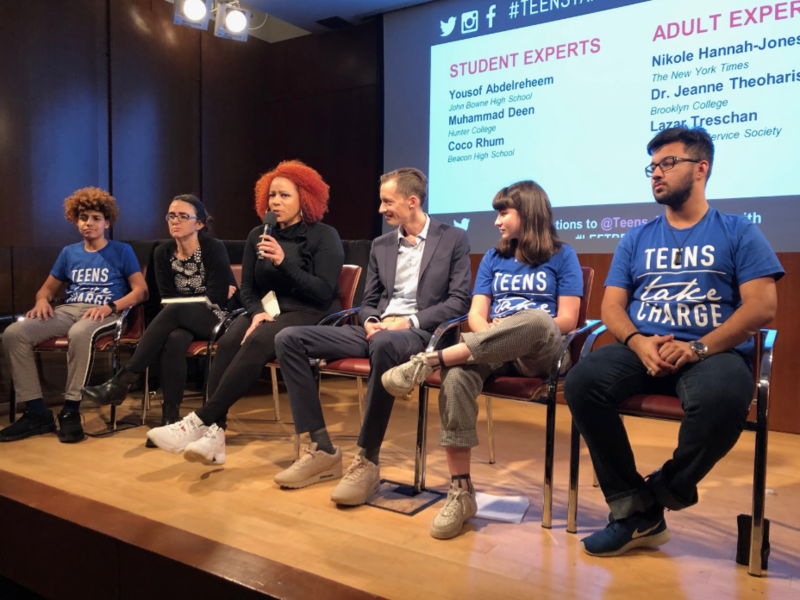 Teens Take Charge is a student-led group advocating for greater voice and representation in issues affecting New York City students. Image via Bklyner. The problems related to the current specialized high school admissions process have become increasingly apparent in recent years, as the collective share of black and Hispanic students attending those schools has declined to nine percent. The Mayor’s plan to revamp the process would eliminate the Specialized High School Admissions Test (SHSAT), a single metric used to determine eligibility, and instead reserve seats in specialized high schools for the top 7 percent of students in each graduating eighth grade class across the city. By taking a more holistic approach to enrolling students in specialized high schools, Mayor de Blasio’s plan would make those schools a more accurate reflection of New York City’s public school system, where approximately 70 percent of students identify as black or Hispanic. While some observers have praised the plan, backlash has come from others, particularly white and Asian parents, and alumni of the schools, who are concerned about sudden changes to a system that has worked well for them and who think the plan will “lower the quality” of specialized high schools or decrease their children’s chances of attending. Example of the news coverage provided by Chalkbeat. We are current NYC high school students and members of Teens Take Charge, a student-led education advocacy coalition that supports the Mayor’s plan. Based on a review of seven news articles and two opinion pieces, Chalkbeat has clearly made an attempt to include a variety of perspectives. In our view, however, the effort has come up short. Although articles published by Chalkbeat have included the voices of people on opposing sides of the issue, including a number of black and Hispanic parents and educators, students’ voices have largely been left out of its coverage. 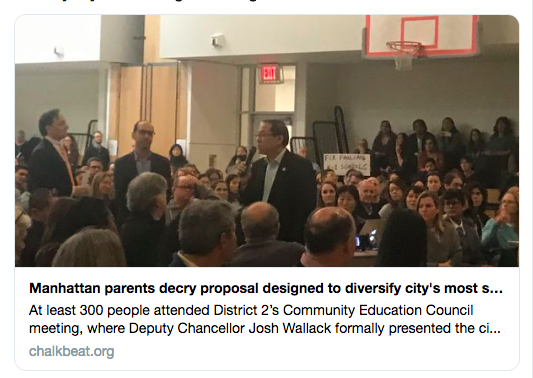 One example that highlights this lack of representation is Chalkbeat reporter Reema Amin’s December 4, 2018 article, Manhattan parents decry proposal designed to diversify city’s most sought-after high schools. While the article is very thorough and provides opposing opinions, it does not include the voices of black and Hispanic parents or students, the groups that are currently heavily underrepresented at specialized schools. After the fact, Chalkbeat published a collection of first-person testimonials from Teens Take Charge members delivered at a public event in Brooklyn held at the same time as the town hall. The fact that Chalkbeat chose to cover a Manhattan parent town hall instead of an event of equivalent size that featured the voices of students within the school system is indicative of the problem. There is an overall lack of youth voices in Chalkbeat’s coverage of this issue. In the articles we analyzed, about two dozen adults were quoted, compared to six students — all of whom attend the same school and were concentrated in the same article. The only two opinion pieces were written by adults. Responsible journalism depends on including all voices, arguments, and perspectives. A first-person essay included in Chalkbeat coverage of the specialized high school debate. Another Chalkbeat piece that shows the continuously dominant voice of those with privilege is Manhattan parent Alexis Audette’s first-person reflection on her children’s journey through the New York City public school system. 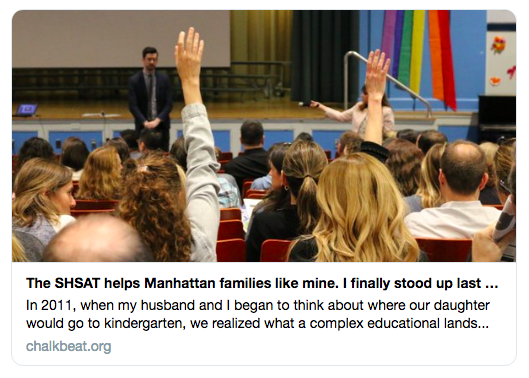 Titled The SHSAT helps Manhattan families like mine. I finally stood up last week to say that’s wrong, the piece describes the choices that Audette, a white woman living in Hell’s Kitchen along with her Indian-American husband had to make involving the education of their children. Audette is speaking out in support of the Mayor’s SHSAT plan, against the common views of her community. While the inclusion of privileged voices speaking out against their community is important, it does not replace the need for underprivileged voices speaking for themselves. The perspectives of black and Hispanic students, parents, and educators are essential in understanding the complexity of this issue. These groups feel the impact of the city’s segregated school system more than any others. To be complete, coverage of the specialized high schools debate and other issues related to race and equity needs their views. The only Chalkbeat article on the SHSAT debate that features students’ voices is an article by intern Savannah Robinson, titled The scene at Stuyvesant: Students who’ve succeeded at SHSAT wary of new plan, though some want change. However, while the article includes quotes from six students who currently attend Stuyvesant, it does not include quotes from anyone who does not attend a specialized high school, which is who the Mayor’s plan would most impact. Their voices are essential in the discussion. Example of NYT coverage of the SHSAT debate. Similar to Chalkbeat, education reporters at The New York Times have also tried to include diverse perspectives on de Blasio’s proposal. While the Times does a fair job of covering underrepresented voices in the SHSAT debate, there is still work to be done to improve diversity and representation. In fact, out of 22 New York Times articles we reviewed that discuss the SHSAT, just two feature quotes from black or Hispanic parents. Moreover, only two of the articles feature students currently within the education system. By contrast, Larry Cary, the president of the Brooklyn Tech Alumni Association, is quoted in five. 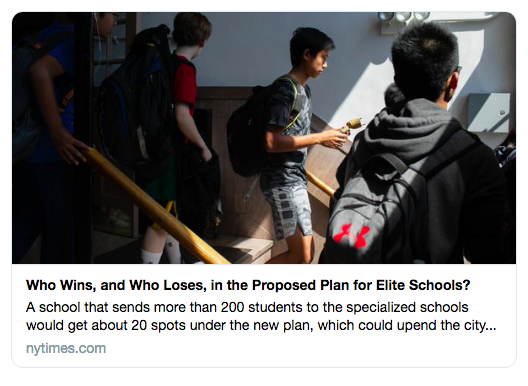 In Who Wins, and Who Loses, in the Proposed Plan for Elite Schools, reporters Winnie Hu and Elizabeth Harris feature Jenny Wong, an Asian mother whose son attends Stuyvesant High School, and Sergio Careces, a Hispanic principal at Rafael Hernandez Dual Language Magnet School, a middle school in the Bronx. Hu and Harris broaden the discussion beyond what the Mayor proposes and allow readers to gain a glimpse into how this proposal is perceived and the impacts it may have on communities. However, although Dr. Careces is Hispanic, his administrative position doesn’t make his stance an accurate reflection of the perspective of black and Hispanic parents who may agree with the proposal for different reasons. His perspective doesn’t address the adversity, frustration, and sacrifice some black and Hispanic families face when it comes to specialized high school admissions. In addition, it undermines the reason why black and Hispanic parents support the proposal and makes it appear as if they just want seats in specialized high schools. Another example, The Test That Changed Their Lives, by Amy Zerba and Gabrielle Guz, features testimonials from a diverse group of nine former students who took the SHSAT. While this range of viewpoints is admirable, there is an overemphasis on former specialized high school students. Only two testimonials come from students who didn’t attend a specialized high school, which means that former specialized high school attendees are disproportionately represented. 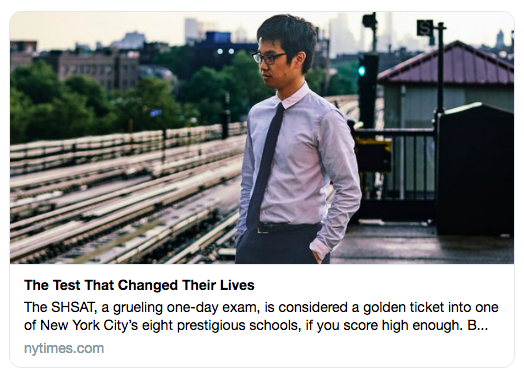 Whereas approximately 20 percent of SHSAT test-takers are admitted into specialized high schools, they comprise about three-quarters of the testimonials within the article. This imbalance reinforces the power structure of the debate where speakers are often former specialized high school attendees or parents of students attending specialized high schools, and little room is given to students and black and Hispanic parents. Additionally, there weren’t any testimonies from students currently attending specialized high schools present in the article. Founding members of Teens Take Charge, a program launched by The Bell in 2017. Without incorporating coverage of students and black and Hispanic parents, media coverage of the SHSAT debate ignores the largest demographic affected by de Blasio’s policy change. This leaves the reader’s understanding of this issue incomplete. Outlets such as Chalkbeat and The New York Times should be doing more to provide their readers with the most complete and diverse sources of information in order to create a well-informed audience. Our hope is that future coverage of the specialized high school debate, and of other education issues, will be more inclusive of families who are rarely offered a platform to share their perspectives. Actively seek out first-person stories from underrepresented demographics. Interview parents at Community Education Council meetings in predominantly black and Hispanic school districts. Interview teachers at specialized and non-specialized high schools with varying demographics. Reach out to youth organizations across New York City in order to find student sources. Long term, work to hire a diverse staff who have attended the types of schools being covered. Smith is a senior at NYC's University Heights High School and a press officer for the student-led coalition Teens Take Charge. Mode is a sophomore at NYC's Brooklyn Millennium High School and a press officer for the student-led coalition Teens Take Charge.